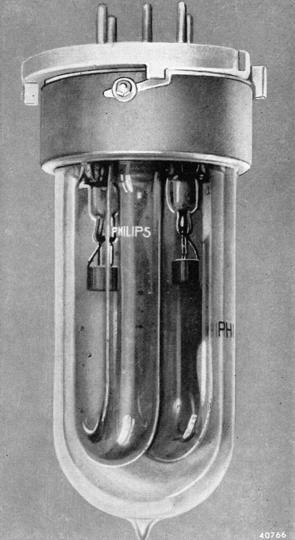 Philips very soon realised that an AC driven lamp which created light from a long, thin positive column discharge was a much more efficient efficient arrangement than the former short arc low voltage lamps, because the efficiency of a sodium lamp increases as the current density in the discharge falls. Thus a long tube was called for and as the gap between the electrodes was increased, this necessarily called for a high voltage to be applied across the lamp. The high voltage had an added advantage, in that lamps no longer had to be operated in long series chains on the mains electricity supply, and each could be connected independently of the others in an installation. Alternating current is absolutely essential for the high voltage lamps, because owing to the great length of the discharge tube, the sodium would all be drawn to the cathode end within a short period of time if it was operated on direct current. In the DC lamps discussed on the previous page, this was not a problem since the cathode is at the centre of a large bulb and it served to maintain the sodium at the core of the discharge. In the first design, again pioneered by Philips, the long discharge tube was double-folded into four parallel sections to achieve a similar compactness to the earlier DC products, and it was operated inside a detatchable dewar jacket to maximise its efficacy. Oxide-coated electrodes were sealed into either end of the tube on a stem assembly similar to that used for incandescent lamps of the time. Four pins of the base supplied current to cathodes at each end of the tube such that they could be preheated before starting the discharge, and the heating current was maintained continuously to ensure that the electrodes were sufficently warm for effiecient operation. The fifth central pin was connected to the discharge tube upper support, acting as en external auxiliary electrode to aid ignition. This style of lamp was famously introduced in late 1932 on the Purley Way in Croydon, UK. It was known as the Philora 'DA' lamp, rated 100 watts at 0.6A and delivered a much improved luminous efficacy of 62lm/W. The DA name implies a Double-folded discharge type having type A electrodes (which require an external heating current). It was soon discovered that as a result of the high voltage across the lamp, sufficient power was actually radiated at the electrodes that they kept themselves warm, and also suffiently robust that cold-starting was possible. Later in 1932 the lamp shown above quickly evolved into a simplified construction having a large E40 screw base, one terminal being connected to each end of the discharge tube. Of course, the elimination of the cathode heating current also made the control gear considerably smaller and simplified the wiring arrangements. -These lamps were known as the type DO - having Double-folded discharge tube with the O electrodes (which are oxide coated and do not require external heating). A lamp of this construction is illustrated in Figure S20. 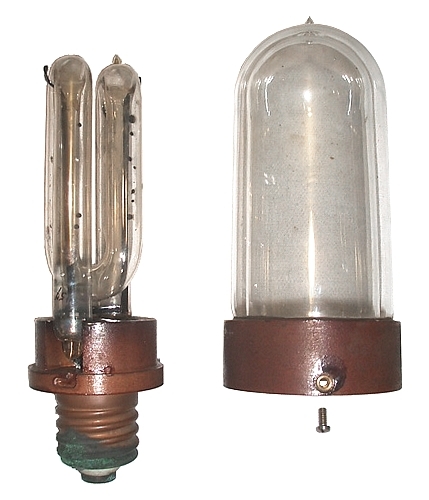 Both of these designs were short-lived, and before the year 1932 was out efficiency was again advanced when the lamp was redesigned into a plain U-shaped discharge tube operating inside the dewar jacket. Although the lamp was not so compact, it had advantages because sodium vapour absorbs its own radiation, and in the DA lamps some light was being lost due to the light from one tube being absorbed by its neighbours. Thus luminous efficacy with the new arrangement was increased a few percent and a complete range of different wattage lamps was put on the market. They were offered in ratings of 50W, 65W and 100W for operation at a current of 0.6A, and a 150W size for 0.9A operation. The name SO/H was coined at this time, and these lamps set the standard for nearly all of the future low pressure sodium developments.